Afghan women entrepreneurs gathered in India this week to exhibit the handicrafts for eager Indian customers. The first of its kind in India, the exhibition brings together more than a hundred traders from all over Afghanistan on Indian soil to showcase their products and search for opportunities in India. “The exhibition is not only a wonderful opportunity to introduce Afghan items to India but also to show a different face of Afghanistan – a country of economic vibrancy and zeal, a country that despite its troubled past is quite eager to change its image,” says Drab in an interview with The Diplomat. Speaking through an Afghan interpreter, the 43-year-old garment designer and director of Barakat Zaman Company, a Kabul-based company, recounts how she traveled all alone from Afghanistan to introduce her wares to the Indian market. Over the three days of the exhibition, she received a “very satisfactory” response and plans to enter into some kind of joint venture with an Indian partner to expand her business. As a garment manufacturer who has been running her small-scale industry in Kabul for the last 15 years, she understands that conducting business from Afghanistan is not going to be easy. She appreciates the conference, “Trade with Afghanistan,” a two-day meet which coincided with the exhibition. Around nineteen countries participated in the event, which was organized to explore economic cooperation and investment opportunities in the troubled war-torn country. However, the intent of the conference and exhibition cannot hide the lurking fear and concern that are in the minds of every Afghan: “People are very anxious about 2014 and life in Afghanistan after that. I have done business even during the Taliban time. But I don’t want them to come back. However, keeping the foreign troops in our country permanently is not a solution. We have to fight our own battles and develop the country,” asserts Drab, who is very vocal about independence for women and feels proud that in the last ten years the situation in Afghanistan has improved for women. Fariha Yaar, 21, also agrees with Drab that women are now more active in all walks of life in the landlocked country. She is in Delhi with her mother to showcase the handicrafts that Morwareed Kabul, her company, produces. A graduate in business studies from American University of Afghanistan, the young girl wants to make a career out of business and introduce Afghan goods all over the world. Yaar expressed some of her concerns about her future to The Diplomat: “You know, I want to focus on business full-time, but you cannot keep your mind off the current political situation in the country. What if the Taliban comes back to power, then what will happen to all the freedom we have got in the last ten years?”Her stall has been quite successful over the last three days and on the concluding day, she received lots of queries from buyers curious about the Afghan traditional dresses, gems and stones. “I like this curiosity among Indians about Afghanistan. I have done my initial studies in Pakistan when my family shifted there during the Taliban regime but that country does not bind me. India attracts me a lot. I like the people and wish there were direct trade routes between the two countries,” says the girl from Kabul. Her mother, Jamila Yaar, is happy that she and her daughter can travel alone and deal with customers in Delhi. She also wants this freedom and independence in Kabul. Humaira Aimaq, a 55-year-old entrepreneur, who, despite her limited linguistic ability, has also succeeded over the course of the exhibition, echoes these feelings. Aimaq employs 40 women in her Kabul factory, which produces traditional Afghan handicrafts and stone products. Although she has been to Iran and other central Asian countries to sell her products, it is her first trip to India and she is encouraged by the response. “I now have an idea what Indians want and what the price range should be. Next time I come back, I will keep Indian interests in mind,” says Aimaq. Out of around 50 stalls in the exhibition, at least one third were in the hands of women. It is not yet clear how much business the exhibition generated over the three days. 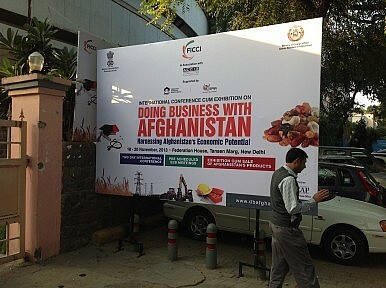 What is certain is that the show managed to market a new image of Afghanistan in India. “I am really surprised at is the kind of confidence Afghan businesswomen were demonstrating. They are not wearing veils. They are modern and this is quite a discovery for me.” says Rashmi, a visitor who came to see the exhibition out of a sheer curiosity to interact with Afghans. Afghanistan and India's Cricket DiplomacyThe Afghan Endgame: What, When, and HowThe Afghan National Unity Government’s ‘China Card’ Approach to Pakistan: Part 2A War of Words? Conflicting Media Narratives Between India and PakistanThe Alliance of Indian Kings: Can a Coalition Defeat Modi’s BJP in the 2019 Elections?